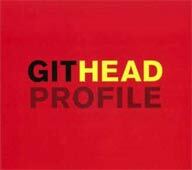 Githead must be one of the most mis-leading monikers in music. [Note to the Americans in our audience: The term "Githead" is somewhat of an insult in British. Think of it as the equivalent of an American term like "dickhead" and you'll see Indoor Miner's point.] As soon as Wire singer Colin Newman announced his new band of that name, it seemed fair to assume that 'Githead' was going to see Mr N continuing in the same loud, shouty fashion as latter-day Wire. So last year's Headgit EP proved something of a surprise, capturing as it did Newman in altogether more melodic mood than he had been of late. Sure there were still those distorted guitars, but overall the distortion pedals felt like they were taking second place to a somewhat more chimy sound reminiscent of the late 80's version of Wire. It was an excellent release, revelling in an altogether sprightly production. So my expectations were running high, which may partially explain why Profile was something of a disappointment on early listens. There seemed something ploddy and pedestrian about the percussion, to such a degree that it was diverting my attention from what else was going on. Still, repeated listens have paid dividends because there's a lot to love here. Newman has always had a way with a tune and his melodies inevitably end up worming their way through your defences. This is typified immediately by the "There's always one thing or another" chorus on the opening Alpha, a superb track that suits the spacious production afforded by its lazy, lolloping beat. My LCA (Little Box Of Magic) follows and was one of the most disappointing tracks on first play for me - though admittedly this was mainly because Colin wasn't singing, but rather his wife, Malka. Sacrilege!! Indeed I initially thought it was like buying Double Fantasy to hear what Lennon was up to and hearing Yoko bloody Ono wailing on about whatever Yoko used to wail on about before she became a smart be-suited businesswoman. WRONG! Malka's voice is ideally suited to My LCA, and what's more, it's a gem. Disarmingly simple, even bordering on the trite, it's a great little pop song delivered with an almost Flying Lizards degree of deadpan. There was a time when this could have been a surprise hit. In my day, it would have reached number 8, son! The next track, Cosmology For Beginners, is even better though. If some people have reduced the songwriting of Kurt Cobain to a 'quiet verse, shouted chorus' description, then I'd describe Colin's as 'shouty verse, great pop chorus'. And this is almost archetypal Newman. It has a borderline mad rant about marsupials, ambulances, and, er, sticky back plastic in the verses, before the altogether more calming chorus soothes us down. I love it, especially when we get those lovable cockney yelps that Newman does so well, interjecting over the swoonsome melody and chugging little beat. It wouldn't feel out of place on A-Z or Not To, and is one of the best tracks on Profile for me. The instrumental Antiphon follows and opens with a bassline that is so like Public Image that I half expected that strange, strangulated voice to pop in and announce that there's two sides to every story, but it soon visits a totally different place. There's a real dub feel to it and is interesting percussively, in that it's got a more clattery, rattley sound than the more meaty effect used elsewhere. So...so far so good then, but They Are is where things slip up for me – and not because it's got a (gasp!) acoustic guitar on it (I don't buy CN records to hear unplugged bloody instruments!). Rather, it's because the song goes on and on without getting anywhere. After several minutes of hearing Colin saying 'they are' this and 'they are' that, I've got admit I wasn't interested in who 'they' were at all, what they were doing, or what they had for breakfast. In short, this is surely the worst song Newman has ever released. Option Paralysis follows and is another one that sounds like PIL. If Antiphon nicked the bass riff of Public Image, I think it's fair to say that this has half-hitched the opening guitar line. But it's also one of the worst offenders when I said I thought the album initially sounded 'ploddy'. It's also the one where I still feel the criticism is valid to some degree. Whilst sticking the drums high in the mix and lowering everything else generally gives a track a more spacious feel, I guess that the downside is that any deficiency in these stakes is magnified. This is a shame because melodically it's a decent enough song, with delicious woos in the background, great chiming guitars, and some nice touches production-wise. Fans of Silk Skin Paws will love it. This is also probably as good a time as any to mention Malka's contribution to Githead, as there's some great driving basslines on the album, quite apart from this descending beauty. (Scanner's contribution is less obvious because virtually all of the guitars here sound like they could be the work of Newman). Still, I can't help wishing that a certain Wire drummer and organic farmer, Mr. Robert Gotobed, had put his shovel and his runner beans down and used those nimble fingers on this one. Wallpaper is another great Newman pop song, and again demonstrates his natural ability with a melody. I really like the incessant, simple beat on this one, too - I guess it's what they used to call a real toe-tapper! But if that wasn't enough, Raining Down is even better. Starting off like a sinister electro version of Bolan's The Slider, this is right up my street and I could have gladly have listened to this steady beat and heavy throbbing bass for hours. And it seems like it's heading that way as, punctuated only by some slashing guitars that feel like small stabbing pains in the chest and the couple of piercing guitar notes that rear their occasional heads, it continues on it's merry way for ages. So it's something of a shock when this great psychedelic sounding chorus pops in from nowhere after almost 4 minutes! Actually, I can't help wondering if Newman ditched the verse on this one because it does have an unusual structure, sounding like extended intro, chorus, intro break, chorus, and end. But far from leaving me thinking, "where's the bloody verse gone", it works. Probably my favourite track of the album.